You are here: Home › single subject learning › Why is creativity important? I recently overheard a student in my music class say, “Joel is more creative than I am because he can draw better than me.” The student who said that is one who I consider to be highly creative. As teachers we all have conscious and unconscious beliefs and opinions about creativity. Can it be taught? Can it be assessed? Is it a ‘gift’? Are we born creative or can it develop? Fortunately, the IB and the PYP have some clear views and thoughts regarding creativity, which are extremely useful when developing and assessing student’s creativity and creative skills. What is creativity and why is it important? In his TED talk from 2006, Ken Robinson stated, “Creativity is now as important in education as literacy and we should treat it with the same status.” While designed to be a deliberately provocative statement, it is encouraging to hear that language learning and literacy should be given the same classroom focus and time as creativity. Today’s high school graduate is entering a workforce that has changed dramatically in the last 20 years. If we think about what it takes today to succeed in the modern workplace or society, creative skills in technology, problem solving, critical thinking, communication and social awareness are a necessity. Two attributes of the learner profile that connect to creativity are thinker and communicator. “Thinkers exercise initiative in applying thinking skills critically and creatively to recognize and approach complex problems, and make reasoned, ethical decisions”. “Communicators understand and express ideas and information confidently and creatively in more than one language and in a variety of modes of communication”. The PYP attitudes can be developed, explicitly modeled and assessed, so therefore, we need to think of creativity as being the offspring of effective communication and imaginative thinking, not a mystical talent or ‘gift’. 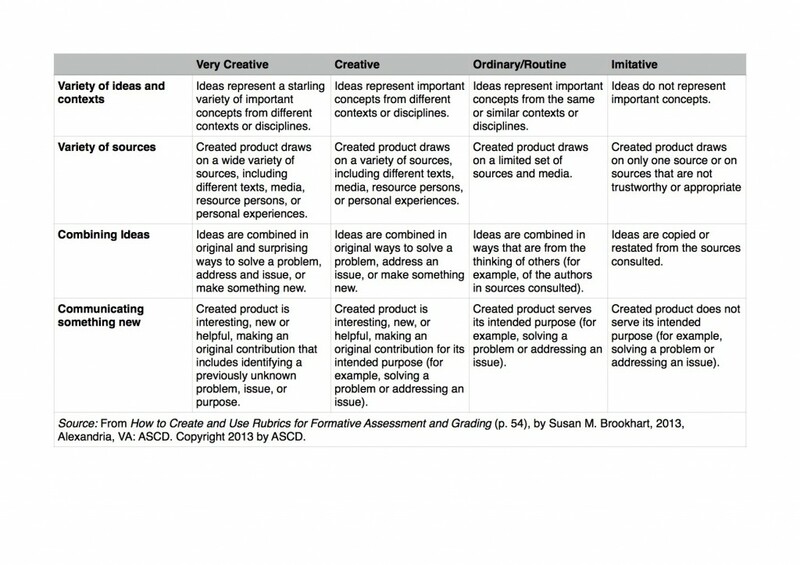 How can we assess creativity? Assessing creativity becomes much more achievable when we realize that we can use the essential elements. Thinker or communicator (learner profile) helps unpack creativity into practical sections. Above is an example of a creativity rubric by Susan M. Brookhart that can be used to assess the creative skills of students and also helps to reflect on personal curriculum planning. How can we take action on creativity? Use these creativity tips with your students. Adapt them to suit your class. Be flexible – If students take the inquiry or the activity in a new direction, let them. Also encourage them to see beyond predictable boundaries. Record creativity – Encourage your students to carry a notebook and pencil everywhere you go. We often have innovative ideas but we can forget them. Model this with your students. Make ‘happy mistakes’ – Highlight ‘failed’ attempts and celebrate them. Help students see them as stepping stones to success rather than end points. Take time-out – Set aside 10 minutes every day to write or speak without thinking. This can be done individually or in pairs and small groups. Practice creativity – Think of creativity as a muscle: use it or lose it. Regular development will refine creative skills and thinking. Do not judge – Keep an open mind to a variety of student ideas or opinions that you had not thought of. Try not to ‘smother’ especially at the start of a task. It can easily kill creative impulses. Plan classroom surprises – Once a day or each week, do something totally out of character. Surprise your students; it will ignite their imagination. Slow down – Allow students time and space to refine ideas and change them. The first idea might not be the best. Challenge them, not rush them. Encourage collaboration – Being creative with classmates is an enjoyable task. Plan to bring students together in a variety of combinations. Process not product – Keep in mind that there is no right or wrong way of inspiring creativity. Try a variety of ways to develop your students’ creative skills. If we are effectively planning, communicating, thinking and collaborating on creative ideas with our colleagues and community, this creativity will inspire our students. When students realize that creativity is a skill that can be developed and not a ‘special gift’ they will be encouraged and inspired. 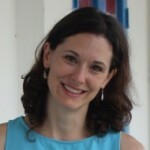 Jennifer Pittaway has taught internationally for the past thirteen years. Her teaching career began in the US and has taken her to Europe, Asia and Australasia. Jennifer has a Masters degree in Music Education from Northwestern University where her passion for creativity and inquiry began. Her experiences with teaching music in the PYP and DP have enabled her to find further connections within the transdisciplinary skills that inspire creative collaborations between both teachers and students. 5 Responses to Why is creativity important? 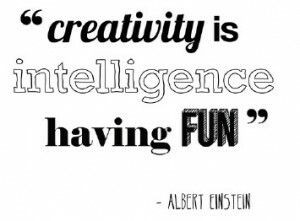 Great blog post to get us thinking about creativity! Ken Robinson talks about literacy and creativity, but of course the two can be part of the same lesson. And creativity and science, or creativity and science. I had a lovely series of maths lessons recently which started with a fraction discussion about a square. Then one of my Year 4 students said “Are we going to be able to make some of these?” and things took off from there. I love the tips for inspiring creativity! Do you have ideas of the types of classroom surprises you did? Great tips! Recording creativity is a big one. Sometimes you may think of a big idea and later forget.